ECR electrostatic contamination removal system captures sub-micron carbon based particles that are the by-product of hydraulic and lube oil thermal degradation. 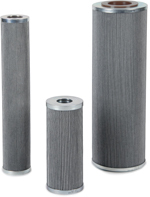 ECR uses a high voltage electrostatic field and proprietary collector elements to remove the sub-micron particles. Typical causes of thermal degradation are pressure induced dieseling and element spark discharge. ECR will return phosphate ester fluid that has turned dark back to its original color in hydraulic or lube oil. Ideal for steam turbine EHC systems with dark fluid. Visit the phosphate ester fluid maintenance products page to learn more about the complete solution for years of trouble free EHC system operation and how to extend the life of phosphate ester fluid indefinitely. 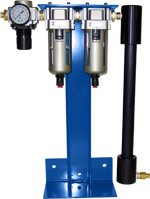 Prevent contamination related variable geometry valve failures, extend useful oil life. Remove & maintain Acid Number to < 0.05 with ICB element technology. Prevent & remove gels & deposit caused by other acid removal technologies (ICB technology removes dissolved metals). Integrated TMRN2 (Nitrogen generator) prevents airborne water & metal ion ingression, and removes combustible dissolved gasses (prevent micro-dieseling). 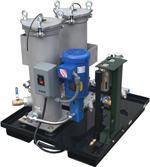 Particulate & insoluble gel / sludge removal with high efficiency on-board filtration. Maintain water content below 200 ppm with TMRN2 and minimize acid producing hydrolysis. 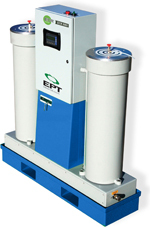 TMR reservoir headspace dehydrator is a key component of the phosphate ester total contamination solution. 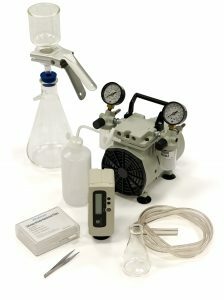 TMR introduces 150°F dew point suppression air into headspace where the oil releases water to the air to achieve relative humidity equilibrium. 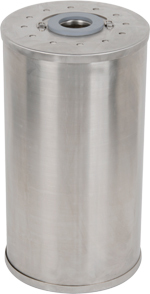 Ideal for EHC phosphate ester reservoirs up to 1000 gallons to maintain a constant water level below 300 ppm. Water is the major catalyst in the production of acid in phosphate ester fluids commonly used in steam turbine EHC systems and aviation fluid. Visit our phosphate ester fluid maintenance product page to learn more about our total contamination solution for phosphate ester and polyol ester fluids. TMRN2 is an active breather system that maintains the air in the headspace that continuously introduces clean dry Nitrogen. As the dry N2 transfers through the headspace at RH < 1% the oil gives up its water striving to achieve equilibrium with the dry Nitrogen in the headspace. Nitrogen is an inert gas so it will also remove combustible gases (ie CO2, C2H2, CO, C2H4, C2H6, CH4, H2) from the oil to reduce oxidation and fluid breakdown.